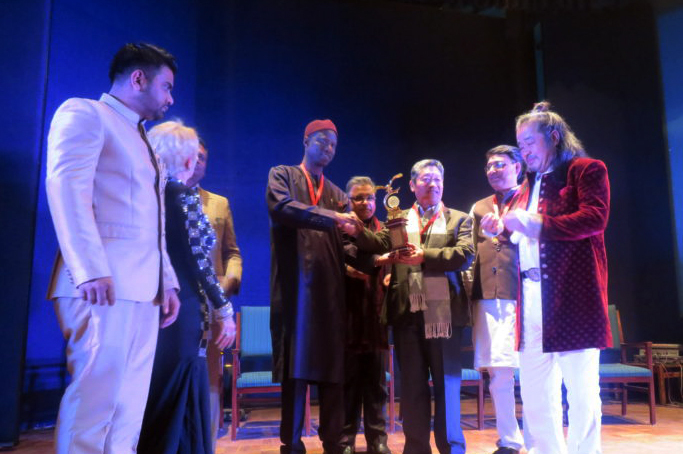 (TibetanReview.net, Feb04’19) – A non-governmental organization dedicated to promoting “World Peace and Love” through arts and artists from around the world has on Feb 2 honoured the Tibetan community in exile with its Art for Peace Awards 2019. The organizers, the Art 4 Peace group, has praised the Tibetan community for being an exemplary community of harmony, peace and happiness. The prize was received by Representative Kasur Ngodup Dongchung of the Bureau of His Holiness the Dalai Lama at an event held in the Teen Murti Bhavan, New Delhi. It was presented by the group’s founder and CEO, Dame Dr Munni Irone. Those who attended the event included diplomats from several countries as well as intellectuals and artists from different fields. A message from HH the Dalai Lama for the occasion was read at the start of the event by Mr Ngodup Dongchung. In it, the exile spiritual leader of Tibet appreciated the organizers for their mission towards spreading peace in the world and thanked them for bestowing the peace award to the Tibetan people. The Art for Peace Awards is an annual award.